This thing would have to be downright awful underneath not to be a bargain. 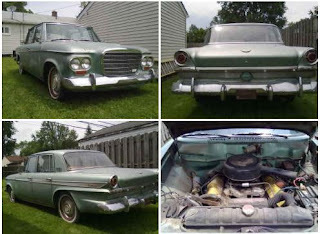 But a four door Lark in the common yet desirable 'Green Mist' color with the Powershift auto and boost-me-please Studebaker 289? Larks are inherently undervalued but how is this 'dependable' car only $1500 or best offer? I really wish I didn't have so many projects right now. Being a once-member of the Studebaker Driver's Club and having cut my teeth on Studebaker big and little sixes, 232s, 259s, blown and non blown 289s, I am very partial to anything from South Bend or Hamilton, Ontario. Selling my GT Hawk may have been a regrettable decision, but I'm damn sure it wasn't my last Studebaker. Unfortunately, under no circumstances can this be my next Studebaker.